Make an impact in a compact footprint. 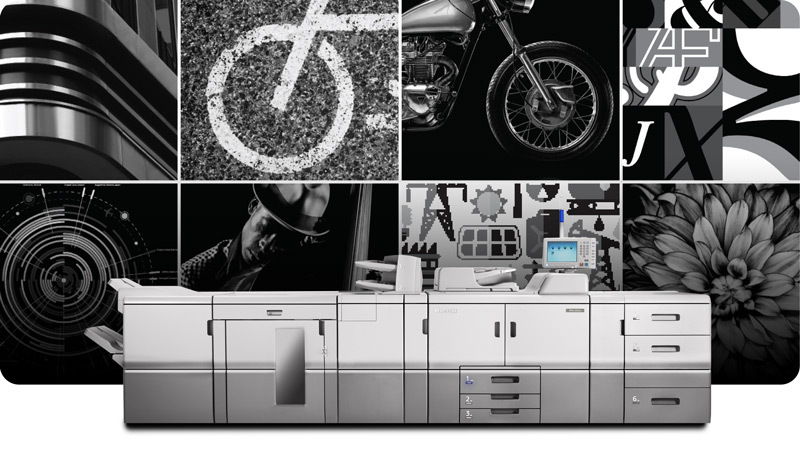 The RICOH Pro C5200s Series offers exceptional ease-of-use, superior image quality, robust paper handling, and outstanding output for In-Plant customers and Commercial Printers. These compact and affordable systems feature an innovative Paper Library, controller options that match workflow applications, and Ricoh's optional Smart Operation Panel for increased productivity and convenience. Support for heavy, textured, and synthetic substrates up to 360 gsm and oversized prints up to 13" × 27.5"
Go ahead, be an industry game-changer. The RICOH Pro C7100/C7100X is designed with industry-leading features that open the door to new opportunities and increased profits for today’ forward-thinking print service providers. 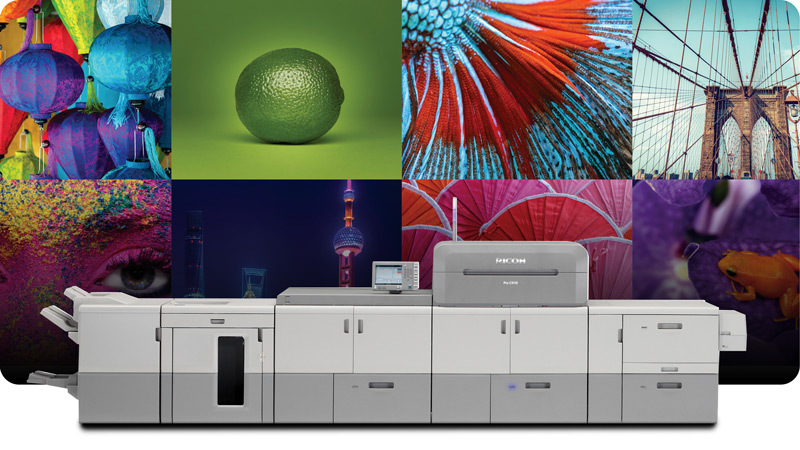 The Pro C7100X Series is Ricoh’s first 5-station Color Production System with the ability to print Clear, White, and Neon Toner for high-value, premium applications. Supports a wide range of substrates up to 360 gsm and oversized prints up to 13" × 27.5"
Take high-performance productivity to the next level. The RICOH Pro 8210s/8220s/8210/8220 delivers consistent performance page after page with rich blacks, fine lines, and crisp text. 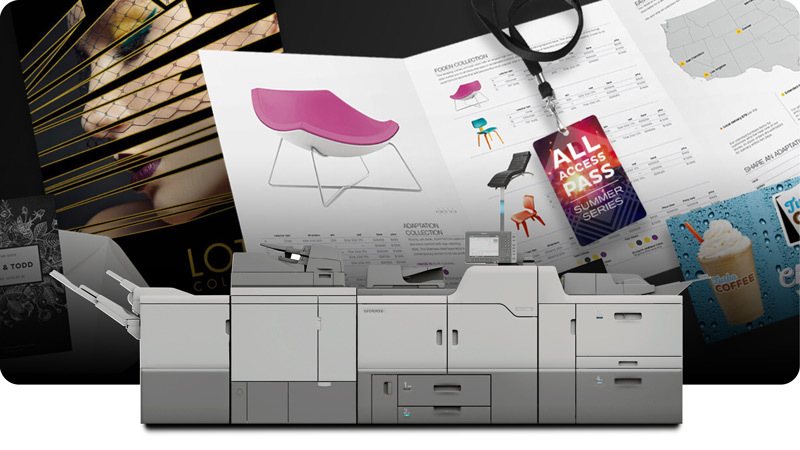 Built to handle up to 1 million pages per month, they give Commercial Printers, In-Plants, and Data Centers more options including NCR, synthetic media, oversized sheets, and affordable, versatile finishing. Supports media up to 350 gsm and oversized prints up to 13" × 27.5"
Raise the bar with convenience, quality, and reliability. The RICOH Pro 8200EX and 8200s are designed to meet the diverse, real-world needs of Education and Corporate production volume environments. 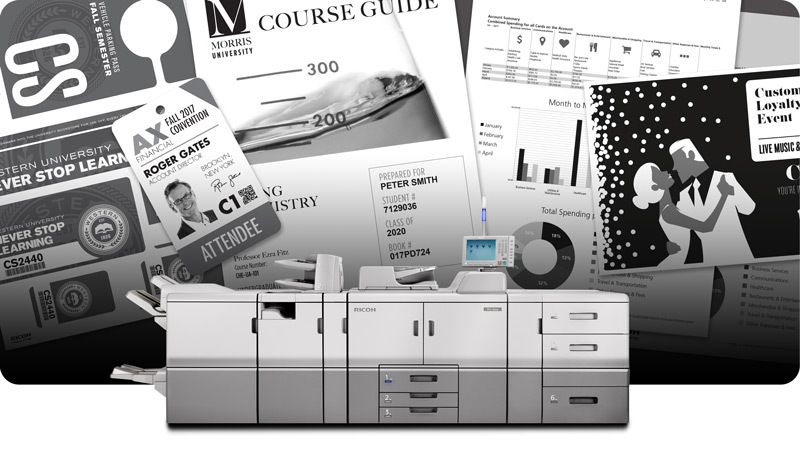 Both models offer an intuitive, user-friendly experience, superior media handling, and professional finishing for end-to-end document production that is on time and on budget. 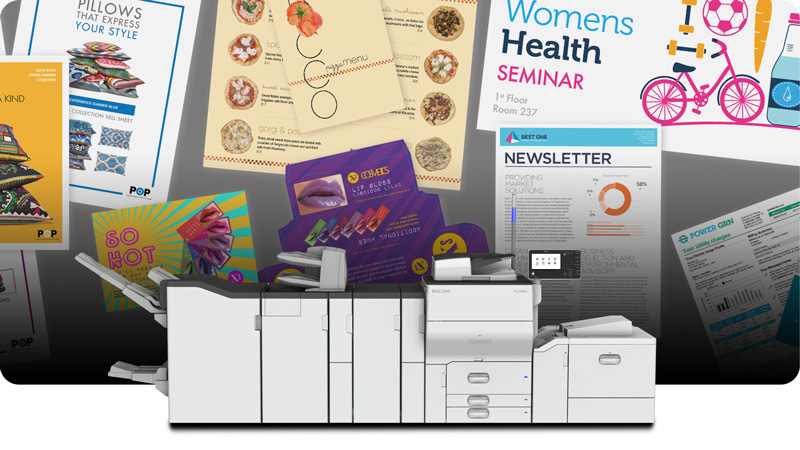 Choose from a dedicated copier or versatile MFP. Breakthrough success with high-volume power. The RICOH Pro C9100/C9110 is the right choice for production environments looking to expand their current digital capabilities with a high-speed, high-quality system that can handle volumes up to 1 million pages per month. They deliver superior reliability, outstanding image quality, and impressive productivity for end-to-end automation. Supports a wide range of substrates up to 400 gsm and oversized prints up to 13" × 27.5"
Create efficiencies that drive measurable results. As a technology innovator and committed partner, Ricoh offers best-in-class solutions and services to help your business thrive and stay ahead of the curve. We work collaboratively with our customers to assess, recommend, and implement customized processes that drive operational efficiency. 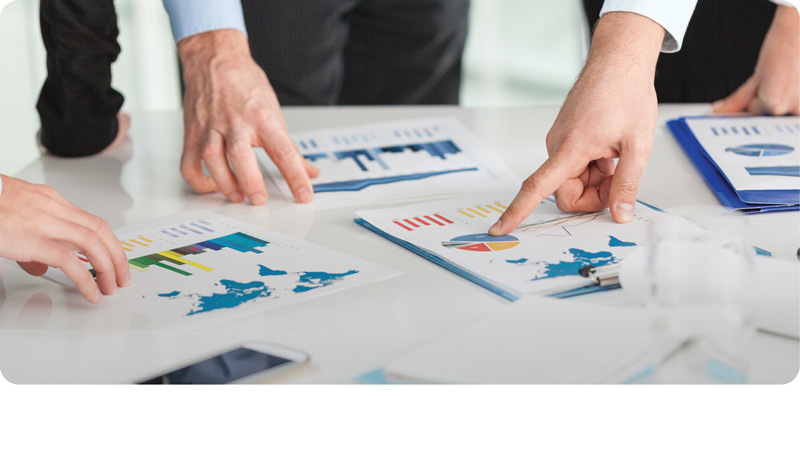 All services are executed by Ricoh’s team of print industry and operations experts, who are among the top in their field and have decades of real-world experience ready to put to use for your business. Ricoh® and the Ricoh logo are registered trademarks of Ricoh Company, Ltd. All other trademarks are the property of their respective owners. ©2017 Ricoh USA, Inc. All rights reserved. The content of this site, and the appearance, features and specifications of Ricoh products and services are subject to change from time to time without notice. Products are shown with optional features. While care has been taken to ensure the accuracy of this information, Ricoh makes no representation or warranties about the accuracy, completeness or adequacy of the information contained herein, and shall not be liable for any errors or omissions in these materials. Actual results will vary depending upon use of the products and services, and the conditions and factors affecting performance. The only warranties for Ricoh products and services are as set forth in the express warranty statements accompanying them.